Over the past year, I’ve been in contact with Juan Pablo Lasso Argote from the Argote farm in Nariño, Colombia. With the assistance of Lennart from This Side Up Coffees, we used the following theory to do a fermentation experiment with JP’s coffee. Nowadays we see more and more fermentation in kitchens and food processing. Even though it seems to be a focus point for food and beverages at the moment, it has always been one of the key quality determining factors in coffee. The base character of a coffee is determined by its variety and microclimate. These factors result in certain levels of sugars, enzymes, acidities, caffeine and yeasts. Most of these, you cannot taste or define in the roasted and brewed coffee, but they do affect the flavours that we can perceive. How they affect flavour lies in the processing method. The previous Shokunin tasting box which showcased three processing methods of the Reko Koba washing station in Kochere, Yirgacheffe, gave an idea of the difference between washed, honey and natural processed coffee. Washed coffee is depulped and then fermented to get rid of all the mucilage and then dried. With the honey process, we only remove part of the mucilage before drying. Natural coffees are dried within the cherries. To summarize, we found that more fermentation (e.g. washed) gives a coffee more acidity, more complexity and more clarity, but also a less intense flavour and less body. More mucilage around the beans during the drying phase increased the body of the coffee but reduced the complexity. These tasting notes seem very logical when we look at what happens during the fermentation stage. Natural enzymes and yeasts break down sugars in the mucilage and turn them into different acids. Obviously, this means that more fermentation leads to more acidic coffees and since acidity is a large part of what we taste in our beverage (sometimes even sweet flavour notes are caused by certain acids), it also leads to more depth and complexity. My hypothesis that I have not yet been able to test is that less fermentation leaves more simple sugars. Since coffee is roasted at temperatures far beyond the point of caramelization, all sugars are caramelized. Caramelization turns sugars into bittersweet nutty flavours and therewith creates more body in the final beverage. Nowadays, since there is more communication between coffee professionals and farms, there is more experimentation going on with specific fermentation processes. Noteworthy is also that people are analyzing yeast strains to catalogue the effect specific yeasts have on coffee flavour. Having control over this variable would give a lot of control over the entire fermentation process and therefore over the taste of the coffee. In 2015, Cenicafé and the Colombian coffee federation did research on fermentation times on Colombian coffee farms. 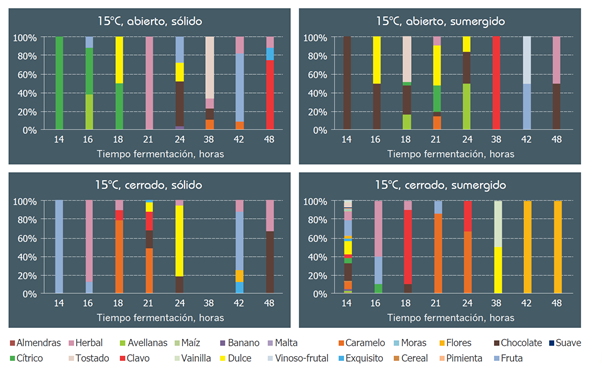 59 farms participated in this project where different fermentation times and techniques were compared. The most important results are displayed in the graphs on these pages. The type of fermentation falls under one of four categories. “Abierto” means open-air fermentation, “cerrado” means covered or sealed. “Sólido” is dry fermentation, “sumergido” is wet fermentation where the coffee is put under a small layer of clean water. 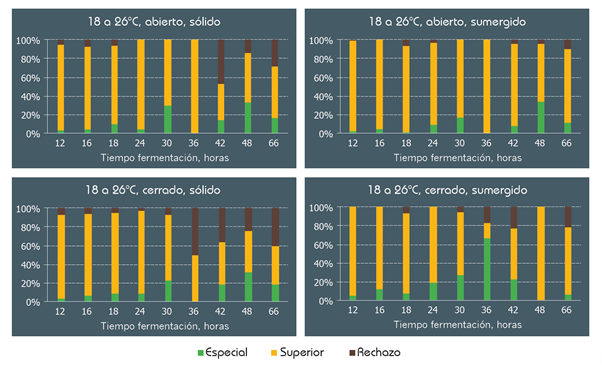 In Colombia, most farmers use dry fermentation because it is faster and therefore reduces costs and risk. Traditionally, fermentation is seen as a risk factor in coffee and people try to reduce this risk. Now that farmers get more and more control over the process, we try to get them to extend fermentation to increase a coffee’s complexity, something we are always looking for in specialty coffee. Apart from these four container types, the results were also divided into two categories of temperature. In the first graphs, the chances of the end result being specialty coffee (“especial”), mediocre coffee (“superior”) and bad coffee (“rechazo”) are shown. Which factors the categories are separated by was not clear, unfortunately, so there may still be discrepancies between the taste preference of the investigators and third-wave roasters. It can immediately be noticed that lower temperatures seem to increase the quality of the coffee. This resembles the standards we usually set for green coffee storage, where we also try to keep coffee at a stable 12 – 14 degrees. The difference between wet and dry fermentation is not as clear, but the chance of bad coffee seems smaller with wet fermentation. In the second, even more colourful, set of graphs, the tasting notes of the different coffees are shown. Obviously tasting notes are quite open to interpretation and every coffee has its own basic character. However, certain nuances can often be linked to fruity flavours, body, intensity or the mouthfeel. 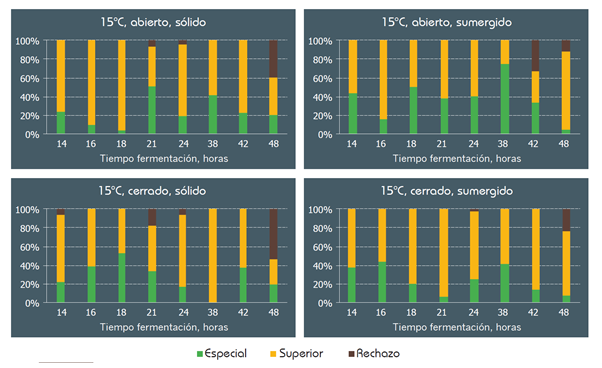 As mentioned before, more fermentation leads to more complexity and brightness and less body. The fermentation tanks that JP built in 2016 allow for a dry, covered fermentation. Those, together with the research by Cenicafe, caused the idea of this fermentation experiment. I asked him about temperature conditions, since the generic climate in that area is quite cold, but he told me I should still look mostly at the graphs for higher temperature to predict his coffee. 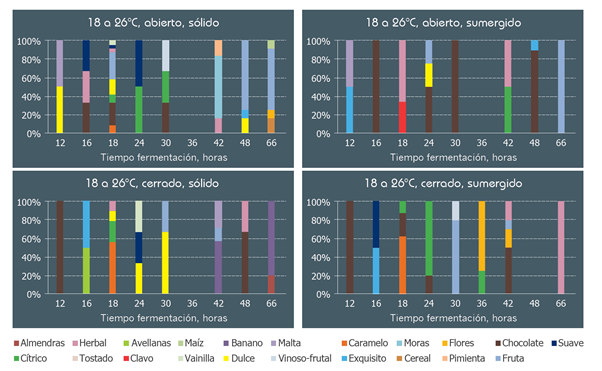 Most farms in Colombia produce Caturra and Castillo varieties, so the flavour notes in these graphs partly originate from the basic characteristics of these varieties. About 10 – 20 years ago, the Colombian coffee federation stimulated coffee farmers to plant the Castillo variety because it is more resilient against higher temperatures and bacterias. However, Caturra cherries should be picked at a lighter hue of red than Castillo, so farmers tended to start picking their cherries before the optimal time. This gave the Castillo variety a very bad name: the coffee could be fermented only briefly because the cherries were not fully ripe, therefore the coffee became slightly nutty and not as sweet as possible. After some time, farmers started planting Caturra again, so most farms currently produce both Caturra and Castillo coffee. The traditional fermentation standard in Colombia is 18 hours. In the graphs, this seems to result in the caramelly and chocolatey flavours that we often find in standard Colombian coffee. However, these graphs also excited me to contact JP to try out a 30 hour, 42 hour and 66 hour fermentation. Based on a combination of the specialty potential and the taste description, 30 hours and 66 hours seemed most interesting to me. I asked JP whether it was possible to ferment a large part of his crop for 30 hours and two small batches for respectively 42 hours and 66 hours. Unfortunately, even with direct chat, communication with Colombia is always somewhat tricky, and in the end it turned out JP had fermented all his main crop for 18 hours and the two separate batches for 42 hours and 66 hours. Lennart Clerkx was visiting JP at the time this coffee was harvested, fermented and dried. Unfortunately he suffers from anosmia, but other people smelled the coffee when the fermentation was finished and told me it smelled like sourdough and banana, which was exactly what the graphs predicted. The project seemed to be successful, but then the wait for exporting and importing started. After all the coffee was processed, we heard half of the main crop had been dried on raised beds and the other half on patios. Since patios store energy during the day, they allow for much quicker drying than raised beds. However, it may sometimes also be a bit less consistent because of the lack of airflow. Also, drying coffee more slowly generally makes it stay fresh longer. Since the coffee cherries start fermenting right after picking, in some weather circumstances the coffee is still fermenting on the drying beds. This is sometimes very recognizable in natural processed coffees like the Reko Koba that was featured in the previous Shokunin tasting box. In order to showcase the widest range of fermentation times with this coffee, we also wanted to let you taste the difference between patio drying (possibly slightly shorter fermentation) and raised bed drying (possibly slightly longer fermentation).